“How to manage stakeholders” is one of the challenges a Product Owner in an Agile environment faces when fulfilling her role. Especially as part of a scrum team, it is important to really engage both customers, and stakeholders to value. Communication and inspection during the sprint review and backlog management are vital to ensuring the engagement of the stakeholders and delivering value as desired by customers and stakeholders. This practice consists of an article describing the Stakeholders Map theory and a step-by-step accompanying guide. This step-by-step guide explains how to set-up a stakeholders map. Refer to the Stakeholders Map Theory article for more information on preferred communication styles and background on the guide. Use an empty A0 flip over and draw the quadrants. Make sure there is enough space to stick post-its without overlap. Take 5 minute per quadrant to map the stakeholders per quadrant. You can ask a Scrum Master or a team member to help you to identify the stakeholders. Also take 5 to 10 minutes to discuss if the mentioned stakeholders is indeed in the correct quadrant. Tip: Use different colors post-its per quadrant. As a team, make a communication plan per quadrant on how to communicate with the different stakeholders. Use the communication suggestions on the Stakeholders Map article. 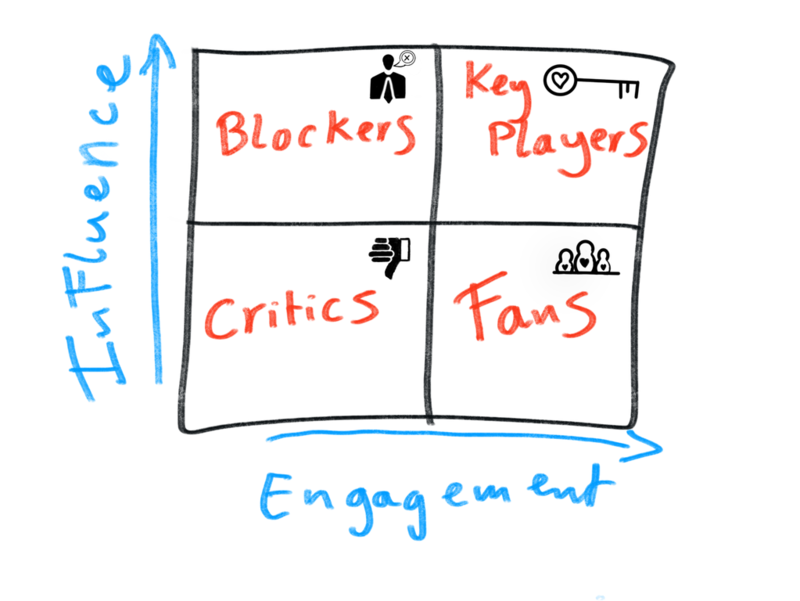 Analyze each stakeholder and determine if they are in the right quadrant. If not, discuss and determine where this stakeholder fits best to achieve your goals. Move the stakeholders which are not in the correct future quadrant. Make a communication strategy per stakeholder on how to get them into the desired quadrant to achieve your goals. Tip: discuss the stakeholders map with your stakeholders to get their view on the quadrant they are in. Also discuss if the preferred communication style is also workable for them. Evaluate the stakeholders map on a quarterly basis.